Edit: We now have a 2019 Version Available! you have chickens? Do you like spreadsheets? Then I have the Egg Laying Spreadsheet for you! No really, joking pitch aside, I have created this free chicken tracker and egg production spreadsheet for you. 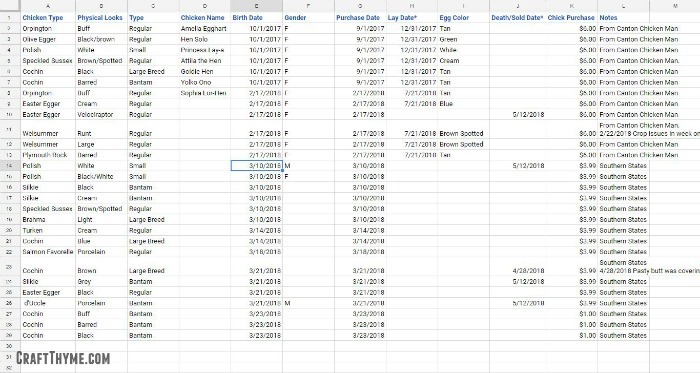 You can scroll to the bottom of the directions to get your free egg laying and chicken production spreadsheet if you aren’t into reading about the spreadsheet. There is also a link copy that shows you what it looks like with data. Who is this chicken tracker and egg laying spreadsheet for? Both the home hobbyist, the small farmer, and geek extraordinaire. 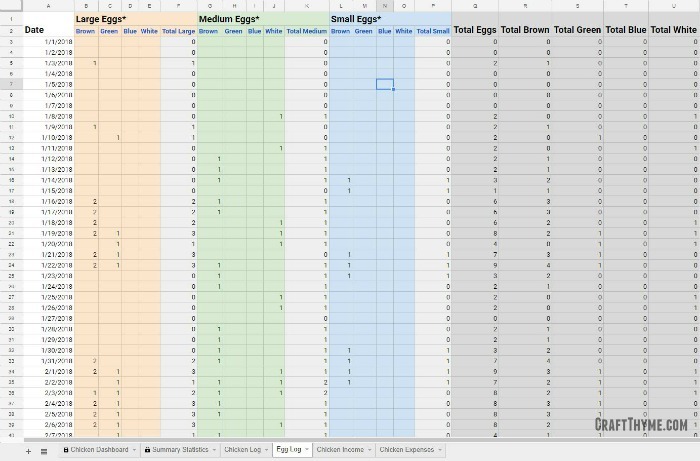 Truth time: I made this chicken egg production spreadsheet for myself because I am a geek and wanted to know if my chickens ever broke even, cost-wise, when I sell their excess eggs (Spoiler: I’d keep the chickens anyway). I love tracking all types of things, but I just cannot do it on paper. I like using Google Sheets because they are free and easily accessible from my phone. 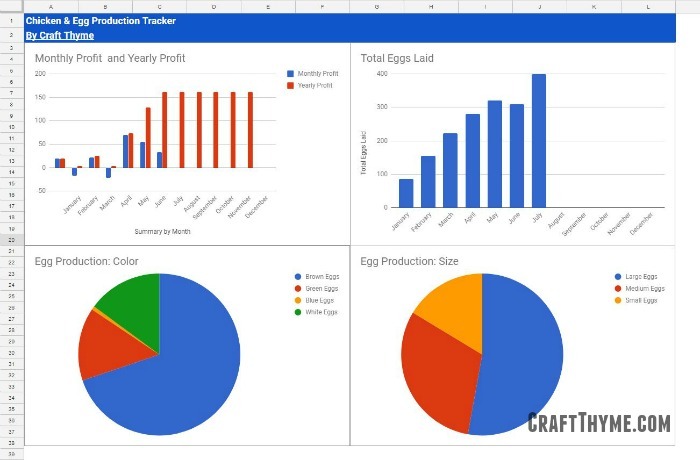 Right now I am offering the chicken tracker and egg production spreadsheet only as a Google Sheet. However, if you desperately need this Egg Laying Spreadsheet in an excel format let me know in the comments. If there is enough interest I’ll convert it for you. I envision a number of enhancements for 2019! But I wanted to get it out there for other people to use this year and give me feedback about what else they might want to see. Best Part! You enter you expenses, income, and eggs in each sheet and the statistics and charts automatically update! Booyah! My day job is in Business Intelligence so I know people need a variety of ways to digest data. For visual learners the Egg Laying spreadsheet starts with some at-a-glance charts. First you can see how your monthly profit is going and how your running year-to-date profit is headed. Trust me, the fake data you see below is nothing like my actual profit… Which is well below zero this year. My favorite part are the egg spreadsheets. Even if you have no interest in profit and loss you can see your total eggs, egg size, and color all compared! Need more numbers? Average eggs per hen? Year-to-date profit on your chickens? Then the Summary Statistics page in the Egg Laying Spreadsheet is all for you. All items automatically populate from the items you enter in the next few sheets. This is the fun spreadsheet! I simply pull this sheet up on my phone when I collect eggs and put in the numbers. It is pretty simple, just put how many eggs of each type and color in the appropriate slots. The totals will auto-calculate for you and update the summaries and charts as you go. I have left what exactly goes in sizes and colors up to you. I tend to put cream eggs with white and tan eggs with brown, etc. but that decision is up to the individual chicken owner. Pro-tip: you can put in total eggs, and skip color and sizes but you will lose you size and color charts. 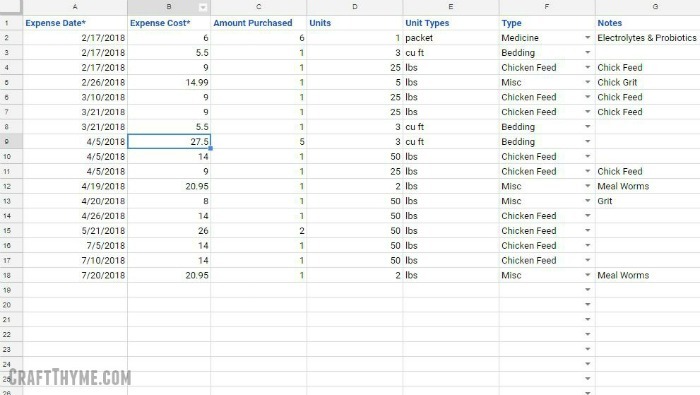 For those chicken owners that want to get a little more into the numbers the expense and income sheets exist. I have some suggested categories for chicken owners, but in reality you can put whatever you want. I am hoping to add more statistics and charts based on the categories in the future. Some examples I am considering: Cost of each egg per amount of feed, Average Carton Price, etc. Categories that must be filled out are marked with an asterisk *. Filling those columns in is all that is required to use the Chicken Egg Tracking Spreadsheet. I really want feedback from you about what else you might want this spreadsheet to do. Please let me know in the comments and if you found it useful then please share this on social media. Empty Chicken Tracker You Can Use This sheet will prompt you to make a clean copy ready for you to fill in with your information. I spent a lot of time creating something I thought might be of value to you, chicken owners, and would like to have your feedback. Please let me know in the comments what other items you might want to see in the spreadsheet. I’ll see about future enhancements for later this year! If I bought several bags of feed at the end of last year does it means i am going to get some “free” feed this year? Similarly if I buy feed this year that lasts a few months, than I will be getting $$$ expense in that month & loss while will be having zero expense and all profit in the following months? I would rather want to track how much feed they eat in different weather or kind of foraging. Looks like need another column as “feed spent” rather than just “purchased”. It really depends on how you do your accounting model. For example I do a model where each year all costs and all money accrued are counted. Some people do all costs and all money received are counted. I did my model, but I can look into adding a feature for following feed ratios over time. I had thought about it before which is why you can put in the amount of food. I’ll add it to my ongoing update list! Thanks for the suggestion. Your spreadsheet looks awesome. Are business owners allowed to use it or is it personal/hobby use only? Yep! Free for any use except reselling it as your own! Just found this and love it!! Looking forward to seeing what you have in store for 2019! Love this! So sad I just now found it, but it’s been nice to use this month! Do you think you’ll have 2019’s posted before the end of the year? I was a little late but it is up now! Just click on the link and it will prompt you to make a copy for your own use! Hi, Iam looking for a egg laying and expense sheet. I don’t have a computer to print out. I would have to write in on a daily basis to keep track of everything. Also need one for raising broilers as well. Could you help me out? I would appreciate it very much. I would be willing to buy a printed copy of each from you. I don’t have a means to print it at the moment. Sorry! Maybe run to your local library? You could print it there. If enough people ask I’ll make a pdf that would be easier to print. I love this! I’ve been searching for something for a while now and this is just what I wanted and more! Thank you so very much. Been messing with it a lot lately. 2019 is going to be even better! Thank you very much for this. I had been looking for an app that would allow me to track eggs, but only a couple I could find and they were not really what I was looking for. Please give us some feedback if you try it! I have been using it all summer and have a lot of modifications planned for 2019! Click on the link and it should prompt you to make a copy to your google drive. That will be your copy to keep and you can enter data at will! Thank you so much for creating this, I can’t wait to try it! Always remember too what Joel Saladin says, “every dollar you don’t have to earn is worth a dollar thirty because you don’t pay taxes on it”. We would buy at least 2 dozen organic eggs a week without our chickens! So looking forward to tracking all this!